Starting out in Photoshop can be scary, especially if you’ve never used a graphics tool as robust as it. With a little effort anyone can learn to be comfortable with Photoshop, but there’s a difference between being comfortable in Adobe’s flagship software and being useful with it. Yet you don’t necessarily need to be a design industry veteran or have completed a nine-week course to work a little magic with Photoshop. The heavy-duty image editing app may look daunting if you’re a complete beginner, but these ten tricks will take you a few steps closer to Photoshop mastery. Ever wanted to fix that family photo where your dad photobombed the kids or some funky lighting made the color of the image all awful looking? With these tips that’s a possibility. 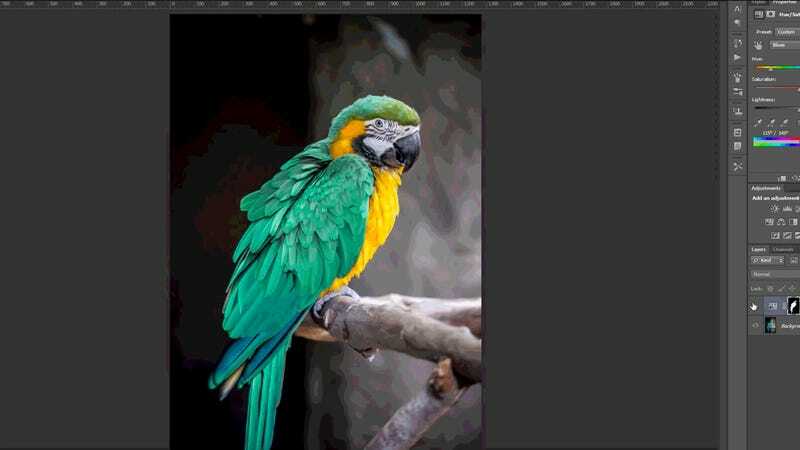 The classic Photoshop trick used to be a chore, but is now made much easier with the Content-Aware Fill tool—though it doesn’t work perfectly in every situation. Use the lasso tool to run a selection around your object and some of the immediate background, then choose Edit, Fill and pick Content-Aware from the drop-down (keep Color Adaptation ticked as well). Photoshop can quickly fix those pictures that have a strange color cast to them (often caused by indoor or unusual lighting). Go to Image, Adjustments, Match Color and click the button marked Neutralize, then click OK. It won’t work perfectly every time but it should give you decent results in a lot of cases without much manual tweaking required. Softening an image can be difficult to get right but here’s a quick shortcut. First duplicate your current layer (Layer then Duplicate Layer) then go to Filter, Blur, Gaussian Blur and adjust the level so the details are just getting lost. Now all you have to do is adjust the opacity of the blurred layer. That opacity adjustment is done via the Layers dialog. Choose Layer than Layer Style than Blending options. Knock opacity from 100 percent to around 50 percent and you get a smart softening effect. It’s a common mistake: shooting people with a bright window or dazzling sunlight in the background, thus putting the foreground faces completely in black shadow. To remedy the situation, click Image, Adjustments then Shadows/Highlights. Then, to lighten only the darkest parts of a picture, use the top slider. You might want to boost the brightness as well. Getting tints on your image is easy enough: click Create new fill or adjustment layer in the Layers dialog and pick Black & White, then tick the Tint box in the dialog box that pops up. It’s sepia by default but you can change this by picking another color in the adjacent box. Other methods are available, but this is the most straightforward of them. One way to shift specific colors without any selections is via a Hue/Saturation adjustment layer. Go to Layer than New Adjustment Layer and choose Hue/Saturation. Now click the finger (seen in the image above) and select the color on screen that you want to alter. Now you can edit that color and only that color, by adjusting Hue, Saturation and Lightness. If you’ve forgotten to use the HDR mode on your smartphone then Photoshop has your back: click Image then Adjustments then HDR Toning and tweak away as much as you like. The number of options and sliders on offer here can be a bit bewildering, so you might want to use one of the preset templates or consult Adobe’s help document. If you open up an image and choose Filter, Blur Gallery and then Iris Blur, you can focus on one object in your photo while blurring the rest. Click and drag the selection to change the focal point, and move the white handles to change the strength of the blur edges. Extra options for the blur can be accessed from the settings panel on the right-hand side. If a photo seems drab and dreary, open something more vibrant as well, then go back to the original picture and select Image, Adjustment and Match Color. Pick the image with the superior color palette as the source and your dreary photo comes to life—the results can be a bit hit and miss but it’s a fun way of getting your pictures looking more appealing.